Haunting music, interesting video, more like a modern dance routine or a minimalist drama. Tiny Human, is the first release from Imogen Heap since her album Sparks, aka HeapSongs, released early 2014. Scamp, her daughter, happened along the way, and was her inspiration for Tiny Human. Imogen Heap, Immie to her friends, has released Tiny Human as an experiment, to test out her idea of Mycelium. The music industry is in crisis, or so we are repeatedly told by the record industry and its apologists. 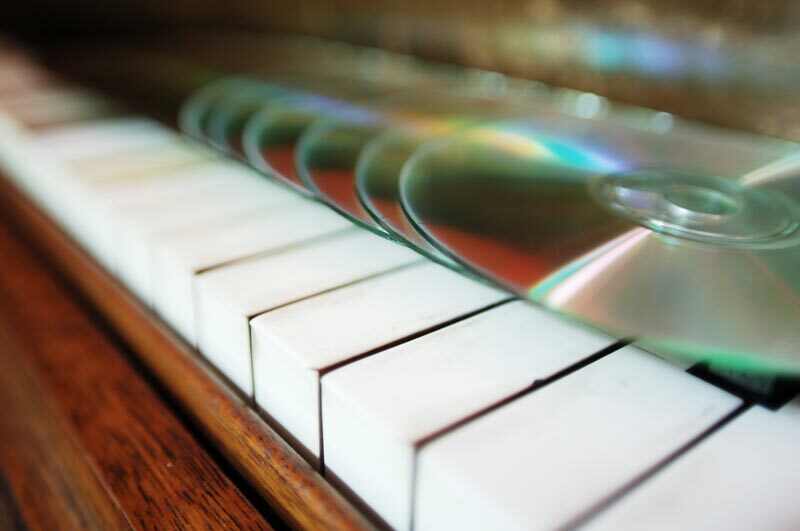 When was the last time you bought a CD or a record? 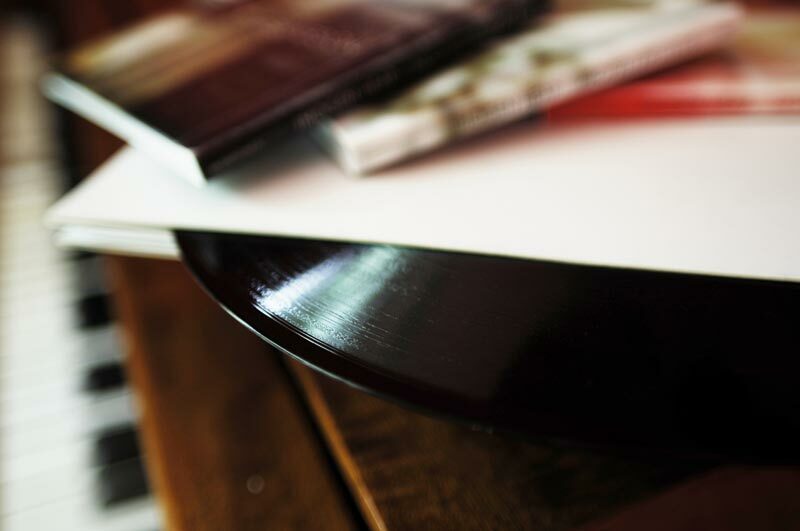 Chances are, you’re listening to more music than ever, but buying less of it. As has been repeatedly shown by bass player Steve Lawson and music professor Andrew Dubber, this is not the case. The music industry is not in crisis, it is in a healthy state, it costs a fraction of what it once did to record and release music, artists can communicate directly with their fans. What is in crisis, is the major record labels, for years they ripped off fans and artists, now they are no longer needed. In terms of sales of shiny circular bits of plastic, sales have not collapsed as we are led to believe, not if we add in DVDs and games. If I look at the last four weeks, I have bought as many CDs as the number of weeks. Actually more, and a DVD, and several books. But maybe I am atypical. What Imogen Heap is trying to do, and using Tiny Human as an experimental release, is to elimnate the middle (unless they add value) and use the blockchain (the on-line database that tracks and logs) to keep track of where the music goes and to facilitate payments to the artist. The blockchain will hold all the information, artwork, recording studio, players, composer, lyricist, all that would be expected in sleeve notes, plus lots more. It could, for example, link to this article. You can download Tiny Human for free, choose if you wish to make a payment using bitcoin. Using bitcoin a mistake, it would have been better to have used faircoin. Faircoin addresses many of the problems of bitcoin, but more importantly, it was established to support projects like Mycelia. Closer cooperation between the two, would be to the advantage of both. Faicoin uses open source software, is reliant upon the blockchain. Collaboration would be in the interests of both. In many ways Mycelia is an extension of bandcamp, which enables on-line listening, payment to artist, album notes, artist notes, and the artist gets the data. Mycelia extends this further and is far more ambitious. To include every artist, could be extended to e-books, indeed anything of a digital nature. No reason why bandcamp could not be a participating partner. What bandcamp has shown, fans are willing to pay for music, support the artist they like. There is no control. I would recommend Tiny Human, or maybe a future release, an album or EP, is released on bandcamp too. There is then something to compare with, currently nothing. Maybe Zoe Keating or Jewelia release their next recording through bandcamp and Mycelia. We will then have a comparison. Blockchain: Each block contains a record of transactions. It is linked to the previous block, and contain a crypto-hash of the previous block. It is transparent, and available to everyone. It is these factors that make it secure. Amazing performance by Imogen Heap at Glastonbury. Hide and Seek, had girls in the crowd in tears. A Capella rendition by Kidderminster College students from Level 3 and 4 Music courses of Hide and Seek by Imogen Heap. Only 200 tickets sold. On the steps of the foyer. Songs are from Sparks, aka Heapsongs, to be released early 2014. Tickets for this 200 capacity show sold out in a matter of minutes. Dusk Songs, 6 songs in 60 minutes at 6pm, with fans given chance to interact with her and gain a unique insight into the stories behind each song. The event was live streamed on youtube, but does not appear to have been archived (or at least I cannot find). #Sparks is the title of my new album. Release 3.3.14. Deluxe shipped 24.2.14. It's a monster! 100 early birds are coming to my house! WOO! Sparks, aka HeapSongs, is the latest album from Imogen Heap, two years or more in the making, due for early release next year. Because so much has gone into making Sparks, that cannot be conveyed in a conventional album, even with a 24-page glossy booklet, Immi has decided to release as a limited edition box set with a very special price. Each track, will have its own DVD data disc. On this disc, studio quality audio, plus music video, plus mini documentary of the making of, plus 16-page booklet. A DVD of the making of the album. A 100 plus page hardback book documenting the making of the album. Immi could make this many more pages. I have suggested to her she also publishes an e-book on LeanPub. A ticket to admit to sound check at one of her gigs when she goes on tour next year. Cards, which when held to an on-line camera, will admit to secret part of website. The deluxe box set is a limited edition of 2,500, with a hefty price tag of £200 each, but Imogen will only break even when 1,800 sold. Deluxe is expensive but not for what it is. I don't break even before 1800 sold. If I sell less than that, I lose money. #CrazyLady! The first one hundred deluxe box sets sold, invite to party at her house. 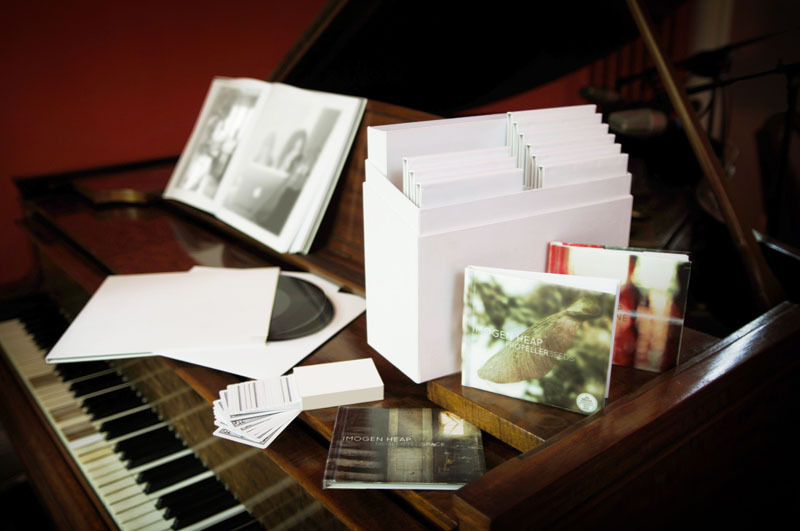 Where you can pick up your own personal deluxe box set in advance of official release. These have already been sold. For many people this is going to be way out of their price range, and yet they may like the idea of having studio quality sound, which is not available on a CD. Follow the example of Steve Lawson. He decided to release all the music from a recent US tour. He did not like a Best of Album, as he thought all the material was worth releasing, on the other hand, to release a dozen albums was not practicable. He decided to release on a memory stick, in a presentation box, together with liner notes. FingerPainting: Complete is, uhm, Complete, and The USB Sticks Are Here! The individual albums are also available on bandcamp for download. Sparks could be on a memory stick, limited edition presentation box. Sparks could be on bandcamp. Bandcamp, could be used to promote the other two. There is now also a Sparks Deluxe blog showing the creative effort going in the deluxe box set as it is produced. Canvas performed by Imogen Heap from her album Eclipse. Avant garde dance routine by Devon Detweiler and Emily Sanderson to Canvas by Imogen Heap at Ecdysiast’s On Aer show at the Alberta Rose Theatre. Ecdysiast (pronunciation: ek-diz’e-ast) a pole dance studio. Ecdysiast, derived from the Ancient Greek word ‘ecdysis’ which means to remove the outermost layer of skin. Jeff beck and Imogen Heap live at Ronnie Scott’s in Soho. Aside from being an interesting scientific experiment, I have to admit I cannot see the point. When we are out and about do we not need all our senses to experience and appreciate our environment? Do we not also need them for safety? Nothing more annoying than those who pollute public spaces with their bad taste in music, especially on public transport, the worse their bad taste, the more they seem to wish to impose it on others. If I wish to listen to music, I prefer to relax and listen, to give the music the attention it deserves (if not it is not worth listening to) and not to use as background noise, audio wallpaper. I am baffled why a phone has an accelerometer. I see the use on a laptop, to park the heads to stop them crashing into the surface on a hard drive, but what is the function on a mobile phone, other than enabling interesting experiments? You are currently browsing the archives for the Imogen Heap category.